(Nanowerk News) Researchers at North Carolina State University have developed a “smart coating” that helps surgical implants bond more closely with bone and ward off infection. 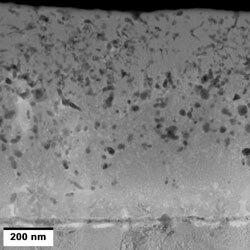 Cross-sectional transmission electron microscope image of the functionally graded smart coating with nano-silver particles distributed throughout the entire thickness of the coating. “The bone grows into the coating as the amorphous layer dissolves, resulting in improved bonding, or osseointegration,” says Dr. Afsaneh Rabiei, an NC State associate professor of mechanical and aerospace engineering, associate faculty member of biomedical engineering and co-author of a paper ("Functionally graded hydroxyapatite coatings doped with antibacterial components") describing the research. This bonding also makes the implant more functional, because the bonding helps ensure that the bone and the implant do a better job of sharing the load. The researchers have also incorporated silver nanoparticles throughout the coating to ward off infections. Currently, implant patients are subjected to an intense regimen of antibiotics to prevent infection immediately following surgery. However, the site of the implant will always remain vulnerable to infection. But by incorporating silver into the coating, the silver particles will act as antimicrobial agents as the amorphous layer dissolves, Rabiei says. This will not only limit the amount of antibiotics patients will need following surgery, but will provide protection from infection at the implant site for the life of the implant. Moreover, the silver is released more quickly right after surgery, when there is more risk of infection, due to the faster dissolution of the amorphous layer of the coating. Silver release will slow down while the patient is healing. “That is another reason why we call it smart coating,” Rabiei says.